Kaboodle and eBay will launch on Monday, at eBay Live 2006, a new collectibles web site, powered by Kaboodle. Essentially eBay users will have the opportunity to leverage Kaboodle features to promote their collection, interact with the community through comments, etc. You will hear more about this new site from the eBay side as their marketing machine kicks in to promote it. Mike Arrington got a preview of the new site from Kaboodle Manish Chandra and eBay’s GM of Collectibles Laurence Toney, and just blogged about it on TechCrunch. I will also mention the site during my panel at the eBay Developers Conference, as an example of how social tools can be used by eBay, over and above the blogs and wikis they have already announced. Congrats to Manish and the Kaboodle team for developing this key relationship, since collectibles is one of the most active category for eBay. And this is one of the first “Web 1.0 partners with Web 2.0” relationship. The TechMeme thread is here. Gary Price’s comments are here. He points to issues of ambiguity with tags being used on collectibles that will be worked upon. Pete Cashmore’s comments are here. Disclosure: Kaboodle is one of my investments. This tag line could very well be related to "An Inconvenient Truth", Al Gore’s thought provoking movie that I recommend everyone to go watch, and ponder upon. But it is actually the tag line of the podcasting channel that the Stanford Center for Social Innovation is launching tonight on Doug Kaye’s Conversations Network: Social Innovation Conversations. The Center, which is part of the Stanford Graduate School of Business, seeks to build a community of people actively engaged in social innovation, and strengthen the capacity of individuals and organizations to develop innovative solutions to social problems for a more just, sustainable and healthy world. It is part of the curriculum of the Standford MBA program, and does research work on organizational aspects of non-profits. The purpose of “Social Innovation Conversations” is to be a collaborative online platform for experts, community leaders, and scholars to share their knowledge across sectors for multi-disciplinary learning. The Center will offer conferences, faculty lectures, speaker events and expert interviews. In addition, leading professional and other academic institutions will be invited to contribute content to the channel to raise public awareness about the grand challenges of the world. Topics covered by the channel include: Corporate Citizenship, Philanthropy, Responsible Investing, Social Entrepreneurship, Sustainability, International Development and Disaster Relief. Not only is it a very interesting program, it is also something close to my heart since the founding Producer for the channel, and Program and Marketing Manager of the Center, is none other than my beloved wife, Bernadette. So here goes for the family plug . One of the most exciting and scary moments for a startup is the moment it ships its product/service for the very first time “for real” – without any password, limitation, etc. It is often the result of months of effort by a dedicated team, and gets you to deal with a new constituency: users. Tonight is Edgeio’s turn, and this is indeed an exciting moment. As Om Malik wrote, Edgeio has received a lot of coverage already and therefore I won’t get too much into a lot of detail of the functionality: Edgeio extracts listings (classifieds, jobs, etc.) made available via RSS feeds, and tagged “listing”. Once a listing has been taken into account, the publisher can add metadata such as the main category under which the item should appear, its price and additional tags. Users can search the marketplace, or use tags and location as filters. There is quite a detailed FAQ here. Here is the item I just posted on my blog listed in Edgeio, and check the Edgeio widget on the right side of my blog. I became aware of Edgeio months ago upon reconnecting with Keith Teare (who I had met years ago), and meeting Mike Arrington as he started TechCrunch. The concept of edge aggregation of semi-structured data was clearly the next logical step in pushing RSS beyond text syndication, hence the appeal of the Edgeio solution. Disclosure: I was lucky (and grateful) that Keith and Mike asked me to get involved in the company as a (paid) advisor about six months ago. More recently, I also invested in the $1.5M angel round that was just announced. A lot has been said about Edgeio, and a number of questions and suggestions will be addressed by the team in the coming weeks – and there are still a lot of interesting features coming up. In the meantime, take a look at the service and send us your feedback. A bonus: here is the end of the IM chat we had with the team just after opening the site. Congratulations again to you guys. If you check my blog, you will see a new search box and tag cloud on the right hand side. It is a swicki powered by Eurekster, a new product which has just been launched at Blogon 2005 – and yes, it is in beta. What is a swicki ? It is a community-powered focused search. Like Rollyo, one has the ability to create a search engine only using only a specified set of sources. You can also specify a set of keywords describing your interest/business, which are in turn used in a tag cloud. I have created an Early Stage Venture Capital swicki, including all the VC blogs in my blogroll as sources. And my keywords are the tags displayed on the back of my new business (tag)card, describing what I am interested in. The initial tag set is augmented by the search terms submitted to the engine. Whilst the current implementation is sort of one way (I select the sources and the keywords), the tool will be eventually enhanced to integrate feedback from the community to influence the results. You can find out more about swickis on this FAQ page. PS: The swicki seems to only search my site… for now. It turns out that I made an error when setting up the swiki, misunderstanding that web searches were restricted to the URLs I selected and that I had to include these to get the intended result. The explanation came in an e-mail from the VP of Engineering of Eurekster who also explained that the search engine was changing the ranking of results based on user clicks, electing to promote the posts that are clicked upon to a higher position. Thanks for the note, Julian! Yahoo’s release of its own blog search was expected to follow Google’s, and it is now up and running. Kinda. Yahoo has made the choice to differentiate itself by trying to bring “blogs to the masses”, essentially mixing blog search results with news articles. The concept, which is interesting, is to make people aware of these additional content sources by displaying them as a right side bar. In the enclosed example, a search on “Yahoo Search Blog” brings results from both sources. I see two issues with the current implementation: 1) the “blog search only” option is not directly available, you have to click on “More Blog Results” in the blog results window and then you have to change the keyword part of the URL manually to search for a new term, and 2) the depth of the index seems fairly limited. Trying an ego search on my name just leads to a couple of dozens results, against hundreds with other search engines. On the positive side, the integration of Flickr pictures is cool. However this is a feature Technorati has had for over a year. So all in all, whilst I buy the interest of mixing both sources, I don’t understand why Yahoo decided to launch with a sub-par product, especially given the excellent podcast search they launched… yesterday. Jeremy is rationalizing this on the basis of providing something different, but this integration should be offered as a plus, not an alternative to providing solid blog search. I was at the TechCrunch HQ tonight (see their post here) and learnt about the latest embargo expiring at 9PM PT tonight: Yahoo was about to release a free open podcast search and directory service, which will be available on podcasts.yahoo.com once the URL resolves (hint: if you were using UltraDNS, it would after a few minutes :-). The announcement has come by way of an exclusive podcast interview of Geoff Ralston, Yahoo’s Chief Product Officer, just released by PodTech.net’s John Furrier. […] We think that podcasts should show up where it makes sense on Yahoo. They will be integrated across Yahoo. Right now we’ve done an interesting integration into the Yahoo Music engine where you can have the same kind of experience on the web directly on the Music engine, or you can download it to your device right there. You’ll start to find podcasts showing up throughout Yahoo if it makes sense like in Yahoo News. There (Yahoo News) you have blogs, so why wouldn’t you have podcasts? Take Yahoo movies, for example, there is already some great podcast out there like Ebert and Ropet and others by a bunch of guys just talking about movies. Why shouldn’t those be findable by Yahoo Movies? And, if you’re interested in a particular set of podcasts, we think there ought to be a personalized experience for you. So when you go to Yahoo Movies, and when we know that it’s you, we should show you the podcasts that you’re interested in. It is interesting to note that Yahoo decided to release this just a few days after the Web 2.0 conference, maybe to make sure that there is no interference around the buzz that this will no doubt generate. Let me guess the headlines: “After Apple, Yahoo brings podcasting to the masses”, “Yahoo does not get podcasting”, “Bye bye Odeo”. How do I know ? Because this is what we have had every time a major actors launches a Web 2.0 functionality: praise, disgust, doom for at least one Web 2.0 company if not all of them. I find quite cool that Yahoo reached out to the podcasting community by doing a podcast announcement. Bravo to John Furrier for pulling this one off. Update: the site is now available, and the first thing that I see missing is an "Import OPML" functionality that would allow me to load up my subscriptions (from Odeo in my case). Searching for one of my favorite shows "For Immediate Release" leads to a result page listing two feeds and a few shows. Clicking on the feed with the largest number of podcasts leads to this feed page. From there, it is possible to download or listen to individual shows, leave a rating or a review and tag the feed. Reviews are manually moderated, so they don't appear immediately. Subscribing to a feed gives the choice of using iTunes or the Yahoo Music Engine, which has been modified to deal with podcasts. This in turn will take care of the automatic downloading of shows and synchronization with a portable device. The podcast directory also includes instructions to publish shows, but this does not seem to include any automation of the process - yet. This actually shows how challenging the process of publishing a podcast is without tools. And since Yahoo is about to bring podcasts to the mass market, they also tell you about "what the heck is a podcast"? 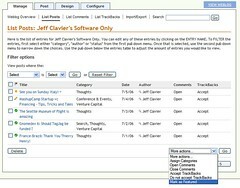 Feeds and shows can be searched through categories, tags or keywords. Besides the lack of import functionality, this sounds pretty complete to me. The integration of podcasts throughout Yahoo is really what I find most notable. Our web-based player makes it simple and painless to listen right through your web browser. An accelerated playback feature (IE only) lets you "scan" a program at 2x speed to get the gist of it faster. You can use Yahoo! Podcasts with aggregators like iPodder (thanks to Andrew Grumet), with desktop media players like the Yahoo! Music Engine (the integration is beautiful! ), iTunes, and with the latest version of iPodder, the Windows Media Player and even Winamp. Or, you can download the shows you want to any mp3 player, such as the iPod, iRiver, Dell DJ, Creative Zen, etc. But wait, there's more ahead… We're already working on personalized podcast recommendations and friendly, easy-to-use tools so that anyone can create and publish a podcast or audio blog and share it with friends, family, coworkers, and the World Wide Web.